We are the first bespoke Dance / Ballet studio to be built in Horsham for nearly 50 years and plan to offer a full range of dance activities for people between 4 years old to 84 years old. People always think that dance in whatever guise, is for the young at heart but now classes will be offered to all ages, allowing you to relive your youth and participate in a selection of great classes throughout the week. on site at the studio., without prior notice. The Studio has been built and designed with dance, rehearsals and auditions in mind. This quiet, light space is equipped with a sprung floor, floor to ceiling mirrors, sound and lighting equipment and private facilities, making it an ideal dance studio or rehearsal room. and archived for your own use. This versatile space works incredibly well for for full production or dance rehearsals, auditions, showcases, filming and photography. The Studio measures 15m x 5m with a maximum ceiling height of 2.85m. It is fully equipped with a whole wall of floor to ceiling mirrors and Ballet barres. 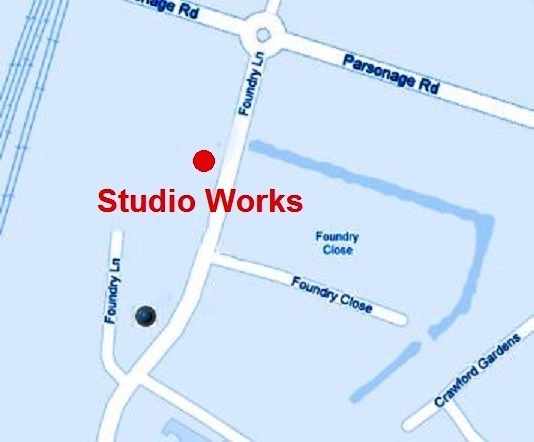 Studio Work's prominent location 8 mins walk from Horsham station and about the same time by car from the M23 turn-off, will allow you to find us easily, regardless of where you are coming from. The new studio, is a purpose made facility and caters for the following activities. As part of Tamara's "giving back philosophy", Sundays are available as a FREE day for those who are regular clients and will be available to use on a strict booking basis. The studio is also available to stage small reviews and shows for any dance schools that need a small and intimate venue to showcase their work, where tables and chairs will be provided along with refreshments if required. For those who attend day classes, we are hoping to utilise the therapy room as a crèche, with fully trained staff taking care of children in a safe and well supervised atmosphere. The studio is also available as a training facility and seminar venue with the latest in audio and visual aides to complement your event. There are many unique features available at Studio works to enhance your activities there and make your involvement at the studio a 1st in dance instruction. This is a ground breaking venue for the Horsham and Crawley area.